From the Warp: Do you have a painting style or do you struggle? Short answer, I struggle. I thought I might take a look at my painting and how it has changed over the past few years. From struggling through learning how to paint different ways to developing a style of painting I enjoy and can call my own. A disclaimer before starting though... please do not read this post and compare your work to mine. We are all on different painting levels and skills. This post is a look at how I've progressed as a painter. Everyone moves at different speeds when it comes to painting. For some folks, the transitions in this post are way slower than they progressed. For others, it will seem like it's impossible to ever do this kind of work. The point is that we are all somewhere along the line of learning and perfecting our own painting style. Here's a look at where I stand. I've been wanting to do this kind of post for a while now. Part as a critical look at my work and part for my own inspiration. If for nothing else than to show that anyone can improve at painting if you keep at and push yourself to understand and try new techniques. In the process of doing that, you'll discover new methods and create your own ways of doing things. From that, you'll keep certain aspects and drop others. The result being a style you can call your own. I'm not going all the way back to the beginning. It would be a funny look back though I'm sure. I'm going to start with this guy since it was around the point when I started getting serious with my painting. And be serious, I mean practicing and trying to do the best I could along with trying new techniques. When I look at this guy, I can see that I did not have great brush control or much of an understanding of how things work. Sure, he's got paint on him, but he's pretty much paint by the numbers I would say. My highlighting covers every edge I could find. The lines are thick and bulky as well. There is no consideration for how light falls on the model and what would be in shadow vs what would be highlighted. This is the beginning of me learning how to line highlight. I do have some blending in there on places like his helmet and chest area. It's not bad from a technical point of view, but it lacks the understanding of how it should be done in relation to the rest of the model. The basing might as well be it's own thing as it and the model are two completely different things. This guy is painted using formulas. Each section is designated something and then painted that way. For example, black armour has a formula, bone has a formula, and so on. Nothing is really tied together on this guy. This guy is not far from the previous model, but there are some things on him that set him apart. He comes along a bit later than the first guy, but not too far as you can tell. He's still the paint by number/formula approach, but the biggest difference here is my attempt to refine the formulas and try including details. Things like the eye lenses on his helmet. They still follow a formula I found somewhere, but now they are included. The purity seals are another example. They are there, but the have been tightened up some. The writing on them is not so sloppy. There is more control in its application. If you notice the line highlights, they don't cover every single edge either. I was starting to develop an understanding of light and how it works over the surface of the model. I'm far from "getting it," but it's no longer the "paint every single edge" approach. That and the thickness is not so bad. Basing still leaves a lot to be desired. It's good, just not there yet. I'm still thinking of it as a separate thing from the model. This guy is included because of what he taught me. He's painted white. Want to teach yourself how to really paint? Try painting a "good" white. You'll learn how to thin your paints, how to not cover up details on the model, a whole host of things. Sure, I didn't get much line highlighting experience with this guy, but I learned about including shadows on a model. Well at least the deep recessed ones. You can still see all the same formulas as before, but the skill level is improving ever so slightly. My shadows stay in the recessed areas on this guy. The little bit of line highlighting on the gun is much sharper now too. If you look at the edge of the crux on his shoulder, you can see the faded highlight there as well. Small improvements. I am trying some new things, but not much. The chest eagle is an example of that. Not the most common color combination you see. Here's where I've made the most progress. Things have started to come together and I'm getting a handle of how it all works as one piece and it's not just a bunch of different formula-painted parts. That being said, this guy is still missing a good amount. He's made the leap from formula to understanding what I'm painting, but I still don't know how to do it well. For example, the armour is smooth, but that's technique. There are a few places where the coloring is incorrect. The addition of battle damage is a big thing here. I love the look, but my application is not the best. The scale is wrong in places, it's heavy handed (something I still struggle with to this day) and it just doesn't look right in most places. My coloring has taken on a much more muted look as well. You're starting to see my painting "style" emerge. I like the darker, more muted colors with battle damage and environmental effects. It's only now that I am starting to understand how to get those effects. Overall, this model is fairly sloppy. The reason being that I don't understand exactly what should be happening on every surface of the model so I can't paint it well enough to convince you. That and I need to work on my golds more. I'd say this guy was one of the first ones where I started to put it all together. From lighting to shading and weathering and all the little things in between. Even then, he's still got lots of work to do. 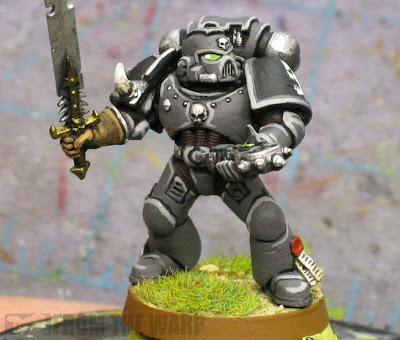 I chose the grey armour because it allowed me to work on my blending and have some room for highlighting and shading. I'm getting better at my weathering as well. It doesn't look so formulaic since I'm starting to get a grasp on not only how to apply it, but where and when it should be applied. I still need to work on my golds (not present on this guy). I've got a good handle on basic metals, but my golds still need lots of work. My weathering is coming along and my basing is starting to tie in much better with my models. They don't look like two separate things that just happen to be lumped together. I'm starting to find a balance with all the extra effects I add to a model. Not only picking the right ones to use, but getting them on there in the correct amounts. I've got my sights set on a few things. One is decals. Now that I'm getting comfortable with the smaller levels of detail, I think it's time I get used to adding decals and such. I need to keep working on my effects like glowing objects and object source lighting. Knowing when to use them is just as important as knowing how, but I have a tendency to leave them off my models now. I like the basic, no-frills look sometimes. Green, There's a color I don't paint often that I need to try and get a handle on. I'd like to be able to paint a really nice green color. And last but not least, I'm going to keep working on my conversion work. The more I do, the better I get in that sometimes it can be tough to tell that the model has been converted at all and that's the effect I'm really shooting for. If you're comparing your work to mine, you're not doing it right. The trick is to look at where YOU started and where YOU are right now. It's not important that you accomplish something within a certain time frame as much as you can look at your first model and notice the improvement between that one and your most recent model. It doesn't have to a huge leap either. Most of my improvements have been tiny as I stumble across things or try new techniques out. Even then, it takes a few attempts before you start to get a handle on something and you can really get it down. I know it does for me. Keeping at it is the most important thing. You can talk about painting all you want, but you need to actually paint to get better at it. That being said, I'm off to paint something so I can put a decal on it. I need to practice. with regards to green, I've found that rotting flesh is the ideal highlight tone to add to a range of greens. It lightens the tone without getting the luminous yellow-green look. Essentially it is the bleached bone of green. Also with regards to decals, check out this: http://piratevikingpainting.blogspot.com/2011/07/workbench-advanced-waterslide-decals.html if you haven't already! Ron - one of the great inspirations FTW (and the wider community) is for me, is that I feel encouraged to try new things. It would be easy to just stick with a formula that kind of works for me and for the sake of having a consistent looking set of figures. But, I think that would ultimately be demotivating and not lead anywhere useful creatively speaking. The FTW community is something that helps keep pushing me forward. My selection of Deathwing figures is already starting to look somewhat disparate, as my preferred style changes over time and technique evolves. I like studying my older figures, because I can still learn things from them, both in terms of what I got right or wrong. Excellent post, Ron! I think I may have to read it again for full effect. I agree, painting style develops over time and it's fun to see how you grow as a painter (even just 3 years for me). I certainly have a style.. it depends on what I'm painting and the colour I primed with. But my "style" is usually dependant on me painting a lot of stuff... like my Eldar army, DnD minis, and a new one I'm developing for my Hordebloods. Correct me if I'm wrong, but you paint a lot of stuff for other people. That requires you to constantly change how and what you're painting. 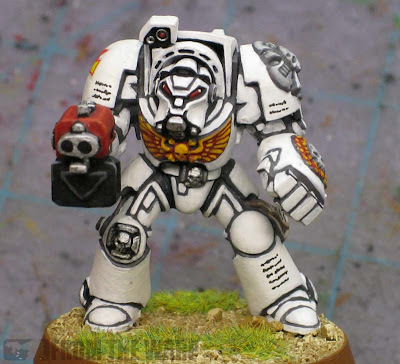 I'm sure if you sat and painted a single army (perhaps your own for the added passion.. like your Deathwing) you would end up with a "style" over that project. I definitely have a style. I'm pretty much at about where you were in that second photo. I've got a decent grasp of colors and lighting, but I don't put the effort in to blending and shading. I'd like to do more of that, because I like the look, but I haven't taken the time to really get it right. One thing that has really helped me advance in painting skill is to paint a wide range of models. Painting Malifaux models has really helped my skill in painting cloth. Line highlighting looks fine on power armor, but looks strange on cloth. 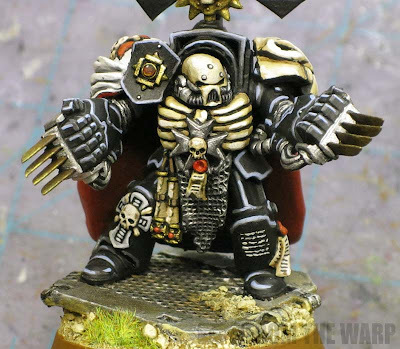 Nice post Ron - I'm nowhere near your level of painting but have been noticing more and more that as I get better, my older models are looking hideously bad. The problem being is that I only collect a single 40K army right now ('Nids), which is no where near complete (approx 4K pts but I want to take it around 10K pts) and the question is - do I go back and re-paint my older work? Obviously, if I do go back and repaint them, then I will improve along the way, making my current "good" work obsolete. Therefore, can a single large army collection ever be of the same standard? May have to post up some thoughts and pics on Weemen. My style has always been "clean and utilitarian" for my Ultramarines. I've never felt the draw of battle damage (unless it was minor to cover up actual model damage), weathering, or hyperrealistic shading and highlighting. I would love to try some of those techniques, someday, but for right now I'm staying the course with my Marines, and am stuck in that formulaic rut. I use the same techniques over and over, and could probably paint my Ultras in my sleep at this point. Theprobelm with adding new techniques is force cohesion. I've been asked numerous times if I airbrush my tanks, to which I replay "no." I airbrush the primer and the shaecoat, and then switch to the hand brush. You see, if I started airbrushing my tanks, I'd have two different motorpools. While they'd both be Ultramarines, they'd look like separate armies, and that looks terrible on the display board. The few advances I have made were with golds and reds. My gold used to be flat, just a gold base and a Sepia wash. Now I start with a brown undercoat, gold base, Sepia wash, and then highlights almost all the way up to silver. Makes a world of difference! I never used to edge highlight my reds, until I started messing around with oranges. Now I edge highlight the armor of my Techmarines and Sergeants, and they look leaps and bounds better than my first couple sergeant models. For my Eldar, I can try a multitude of different pain schemes and options. Even for the short amount of time I have painted, I can still look back on most of my models and notice the sloppy nature they have or the mismatched things I thought worked at the time. Something that I have always found helpful is moving forward with different techniques and more challenging schemes, a lot of times I feel like I am copying or mimicking someones style. But overall, I have seen that progression of trying harder things that are JUST out of reach of your skills is something you can push toward, it is good for your style and finding what works best for a person. I know how mine compares with others who paint, and I know for certain that I look at other blogs (from here and from you) and push myself to make a great looking army and force. Rambling, yes, but I have found that pushing toward harder things is where you need to go. You get your best work out of it. I was away from the computer all day and was honestly worried how this post would go over with you all. I wasn't sure I'd get the honest feedback that's here. As for me, I like the think I'm close to a style I could call my own. Or close to developing something I can refine into a substantial and distinct look. I've long since started collecting the things I do like in terms of painting techniques and letting go of the stuff I don't and it's slowly coming together in a "style." 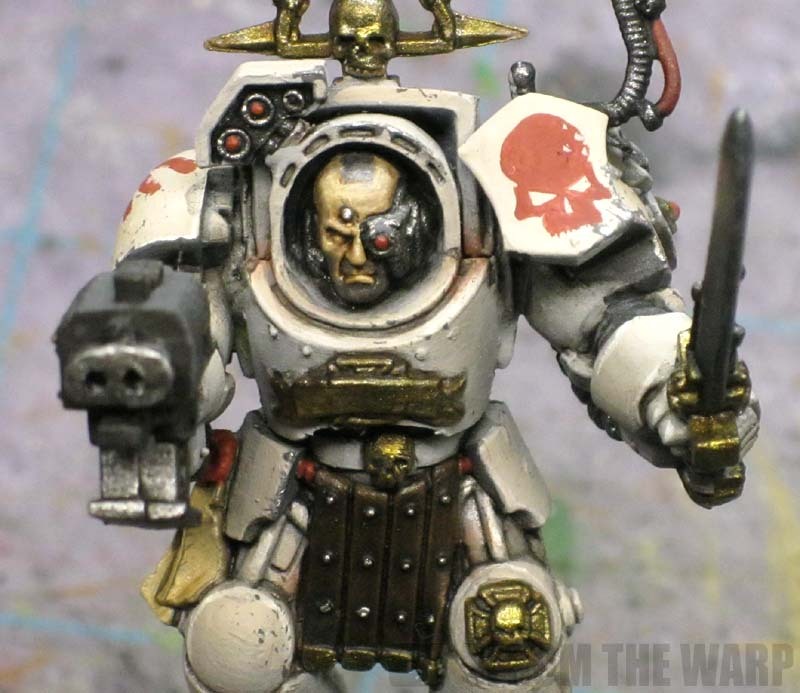 Uh.. although you dislike your paintjob on that terminator (first Pic) I LOVE that conversion... do you happen to have a tutorial on that? Hi Ron, really enjoyed that post. I do have a style, and I hate to disagree with you but I think you do too! We're all individuals, so the way I see it, as your technical ability and your confidence grows, you'll get better and better at making your models look like the picture of them you have in your head. When they look pretty much how you want them to, you will have painted something in your style. So your style and your taste are pretty much the same thing and are unique to you. I don't think anyone with your level of expertise can help having a style, even though you may not be able to see it yourself. You have the technical ability I think that when I see your models I can tell it was you who painted them, because I've seen a few on your site now. I would describe your style as clean (you favour blending over visible brush marks), sombre, and expertly weathered. I like it. Another thing I think though is what do we do once we have a style? Surely that's not the end? I try to paint different armies/projects in different ways depending on what I think suits that force aesthetically. 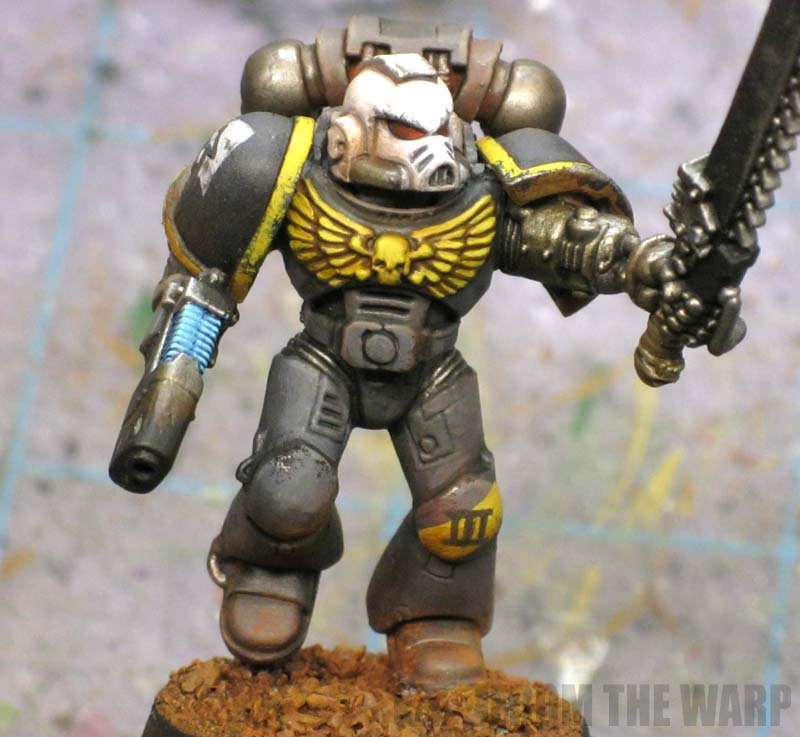 great article its nice to see something like this to remind you where you have come from in your painting skills and to re affirm where you are headin. I honestly was getting a bit annoyed with my progress but when u mentioned kinda how its a personal progression thing i remembered how far i've come... cheers for that ! Anon: Not really. Are you talking about the skeleton chest plate? James S: Getting a style so to say isn't the end by any stretch of the imagination. It's an evolution as you pick up new things and try new techniques. You'll be constantly evolving. FD Mini Painting: That's one of the things I wanted to make sure I got across in the post. That it's not about comparing your work to others, but a personal progression. Why even worry about it Ron? Style is for uniform armies... your stuff looks great - why try to pigeon hole yourself into one type of painting instead of just letting the brush flow? Dave: I think it's more of an identity thing. It's not so much that I want or feel like I have to have a style... but it's nice to think that I (or anyone for that matter) has a look or feel to their models. And to add to that, the look or feel they have to their minis is the same as what they envision them looking like in their head. That's the biggest thing for me. Getting what the model on the table to look like what I imagine it to be in my head. Although I didn't set out, my models especially the Diseased Sons have a signature style. I use a lot of old OOP paints and inks from I guess the early 90s and I also use a lot of non-GW paints now. I had a wash heavy style before GW and others started making their wonder washes. Now I use less washes as I don't like waiting for them to dry. I think I paint slowly and spend too much time on details no one notices or that aren't really very important on the tabletop. I try to do test figs and try to simplify my recipes to get more bang for my buck on each coat. I've repainted and touched up a lot of my older Chaos models, but I have an even older army which I'm not going to spend as much time improving assuming I ever find time and energy to work on another old army which I haven't used in over a decade. This link shows how the models looked before I stripped them and redid them. PS painting green is easy. Red is harder, too often people end up with orange. Muskie: Very cool! It's neat to see the before and after shots next to each other for comparison. As for painting red, that's so easy it's criminal. Green is the one I haven't figured out just yet. Well, Since the start of the year, I've started doing good edge highlighting and I've started adding my own freehand details to space marines. I guess that's a start. Diaord: Absolutely, you try something new, develop a way of doing it that you like, refine it a bit more, try a few more things and all of a sudden you have your "own" style.